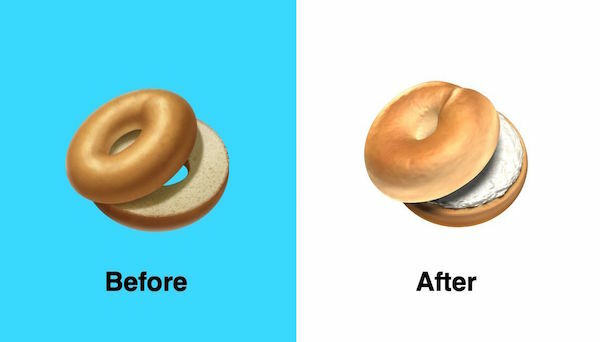 When Apple rolled out its new bagel emoji earlier this month, the lackluster design clearly didn’t take off among New Yorkers and bagel lovers worldwide. The stale, bare-looking carb was described by Grub Street as having a “distressingly smooth crust” that could only have been made by an apathetic factory. Apple has apparently heard the feedback and launched, together with beta 4 of iOS 12.1, a more appetizing redesign. Here, the carb comes with improved, mouthwatering texture plus cream cheese filling. Apple's old bagel design was totally fine to convey the concept of "bagel". There's no doubt the new one looks more appetising though.